And now, back to our regularly scheduled programming. It may seem counterintuitive, but sometimes web apps are better than native apps. Now that browsers are so advanced and powerful, web apps can integrate with the operating system, are fast and easy to update. 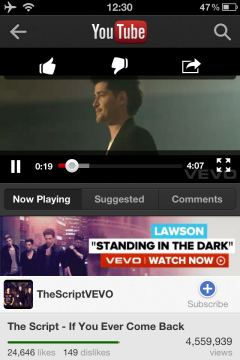 Take the new YouTube app for iOS. 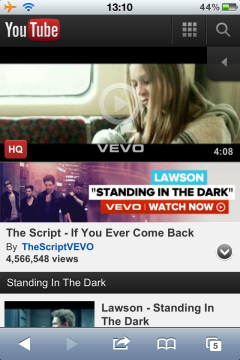 Now that Apple removed the YouTube app from iOS 6, Google had to develop its own app for YouTube. The application looks just like the YouTube for Android, but it doesn't properly integrate with the operating system. It doesn't support AirPlay, so you can't redirect videos to on an Apple TV or a computer. You can't close the YouTube app and continue playing videos in the background, which is especially useful for music videos. The new YouTube app doesn't let you switch to the low-quality video flavor, which is better suited for slow Internet connections. Perhaps the most annoying issue is that the YouTube app doesn't buffer the video when you pause it and the unused buffer is discarded when you close the app. Let's say you start watching a 10-minute video and you close the app after 3 minutes (for example, you get a phone call). Even if the video has been completely buffered, the YouTube app will download it again once you go back and tap the "play" button. The same thing happens when you open the Notification Center or double-click the Home button. What if you're trying to find a video and you enter multiple queries? How do you go back to the start page? Just the tap the "back" arrow for each query you've typed. That's really annoying. What if you want to see the most popular YouTube videos today and you're signed in to your Google account? Just scroll the entire list of subscriptions from the sidebar and you can finally see the "popular" section. Surprisingly, none of these issues happen in YouTube's mobile web app available at m.youtube.com. Sure, the web app doesn't look so polished and you can't read the comments while watching a video (you're not missing too much), but it works pretty well. Google will probably fix these issues in the future releases, but for now YouTube's mobile site is better. And speaking of mobile apps, if you have an iPhone 5 or you've updated an iPhone/iPod Touch/iPad to iOS 6, it's worth trying the mobile Google Maps available at maps.google.com and even adding a shortcut to the home screen. Google takes its time developing the Google Maps app for iOS. We just need a simple way to do a better 'iconization' of web apps. Seel web apps in app stores and manage then into your mobile system like a native app do. From this blog post , i can feel that how Google's culture spreading across their employee....Apple please don't be evil. The buffering problem would be an iOS limitation. Apple let's Safari run with true multitasking, but won't let the Youtube app do it. If the buffering worked fine in the old Youtube app, that would be because it was written by Apple and allowed to bypass any restrictions like Safari is.